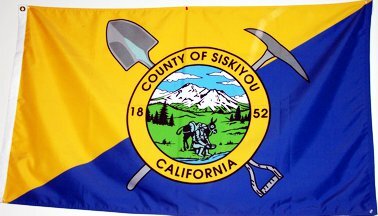 The flag of Siskiyou County consists of a yellowish gold and medium blue background, with the seal centered, and a gray shovel and gray pickaxe behind the seal. Siskiyou County is in the State of Jefferson Region in Upstate California, bordering Oregon. With flag status info for all 58 California Counties, I can verify 28 have an official/unofficial flag. Thanks to County Supervisor Marcia Armstrong for this high quality image.